We’re back in Belgium for more then a month now. after a fast update when we just flew out of the Range there was a long silence. I tried to write down the story of our climb and work myself trough the pictures. But soon ended up in hectic job, which gives me almost no spare time for picture editing. 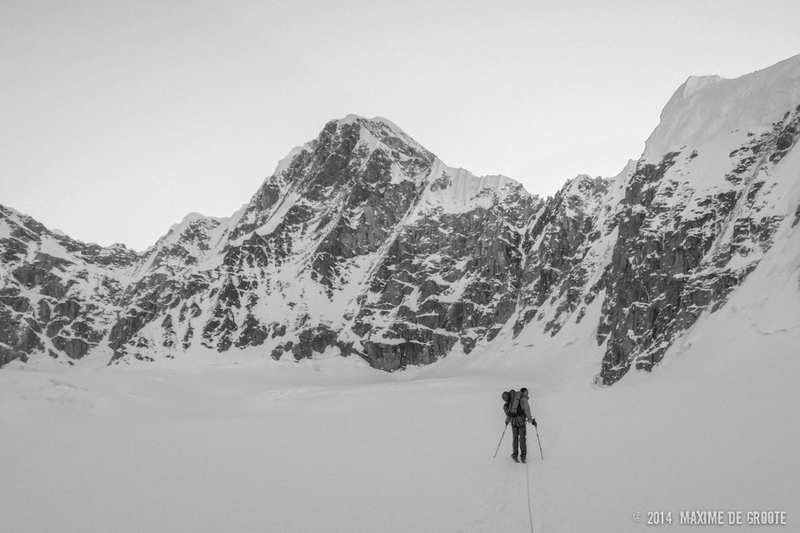 Anyway here is the first part of our trip to the Central Alaska Range. 26th of April, we arrived in Alaska. 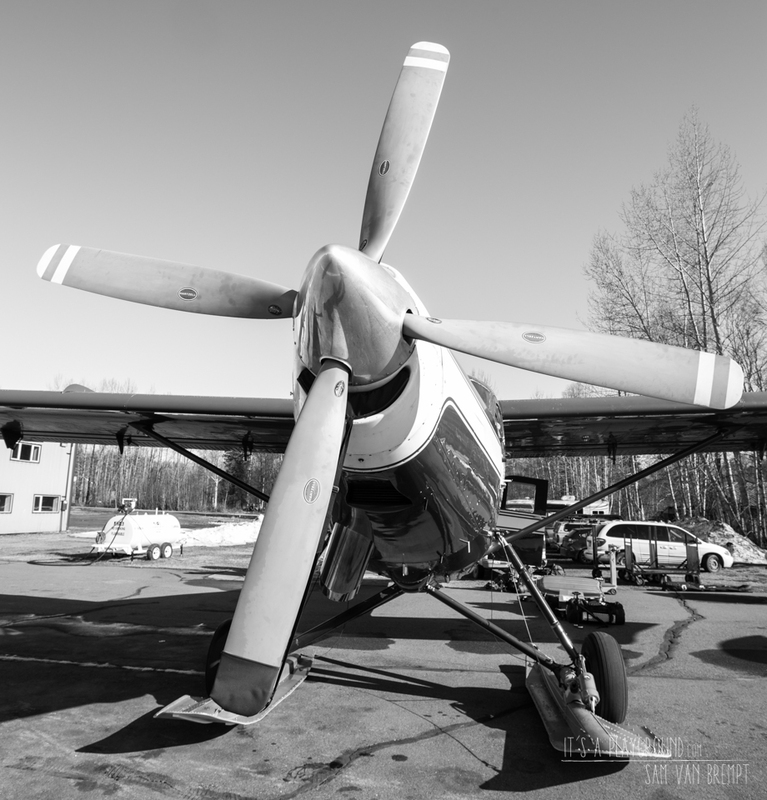 After a shopping day in Anchorage we drove up north, to Talkeetna. Checked in at the Ranger Station and made everything ready to fly into the Mountains. Weather seemed good but still tired from the last days before departure, we could use another rest day. 29th of April we we’re ready to fly to the Kahiltna Airstrip. Together with 2 other teams we’re dropped of on the glacier. 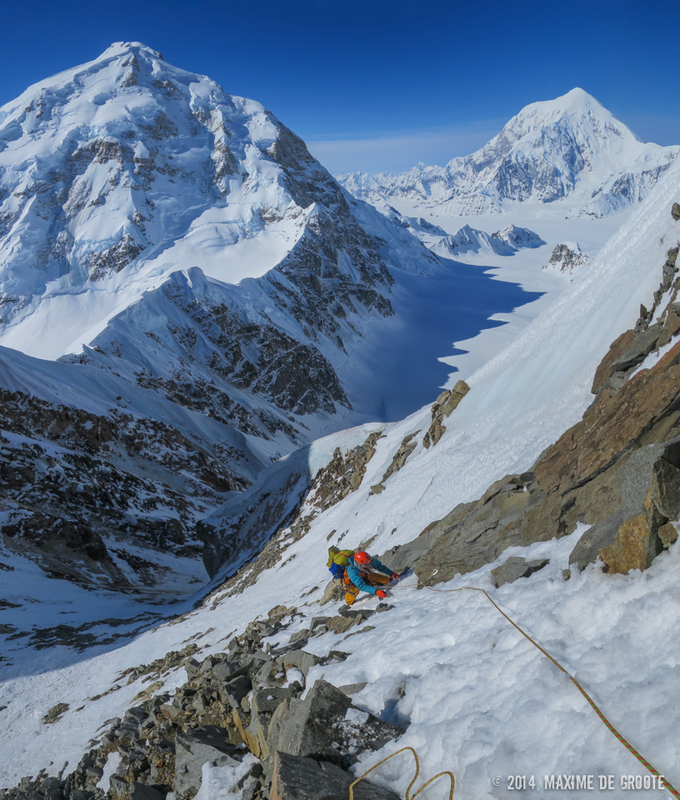 A first look up to our main objective, Mt Hunters North Buttress, and a small talk with TAT pilot, Paul Roderick gave us some doubts. The ice was thinner then other years and this year nobody tried it yet. There even was no other team planning an attempt. 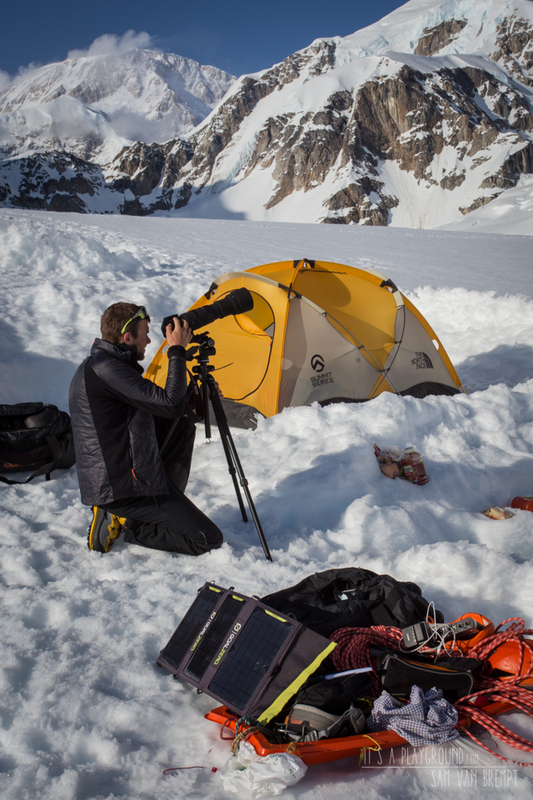 As we set up our basecamp, the 2 other teams left and heading in the direction of Denali. There we’re some deserted tents, basecamp was not installed yet so when Paul lifted of it was a nice feeling, alone there! A last short snow shower and the weather forecast gave us 4 days of perfect weather. We did a trip up into the southeast fork scouting for route conditions and our thoughts about thin and dry conditions were confirmed. On the 1st of May we left basecamp late morning and started the 2-hour hike to Mini Moonflower. 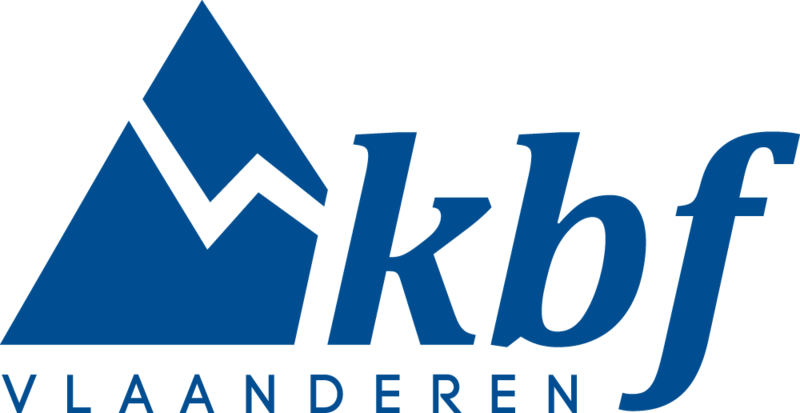 Mini Moonflower is a small summit on the ridge between Mt Hunter and Kahiltna Queen. 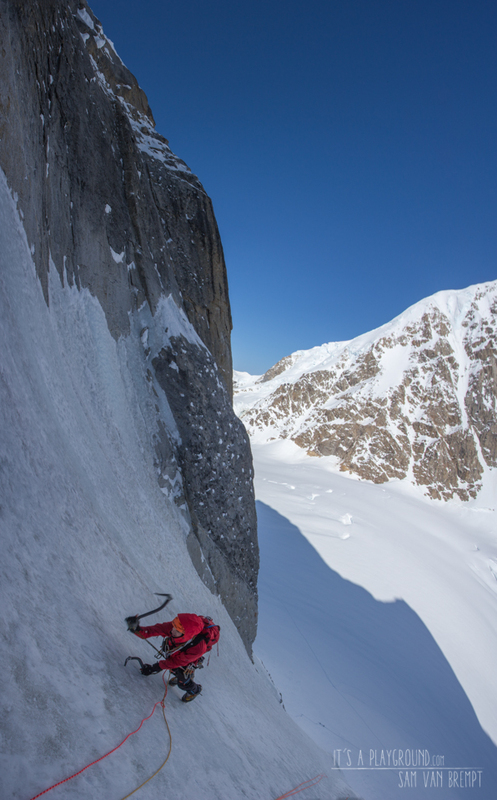 We were hoping to climb its 600 meters North Couloir but were still wondering how to pass the crux without ice. We crossed the shrund easily and started climbing the lower couloir. There was hard blue ice but we managed to find some neve runnels, which made the climbing faster. 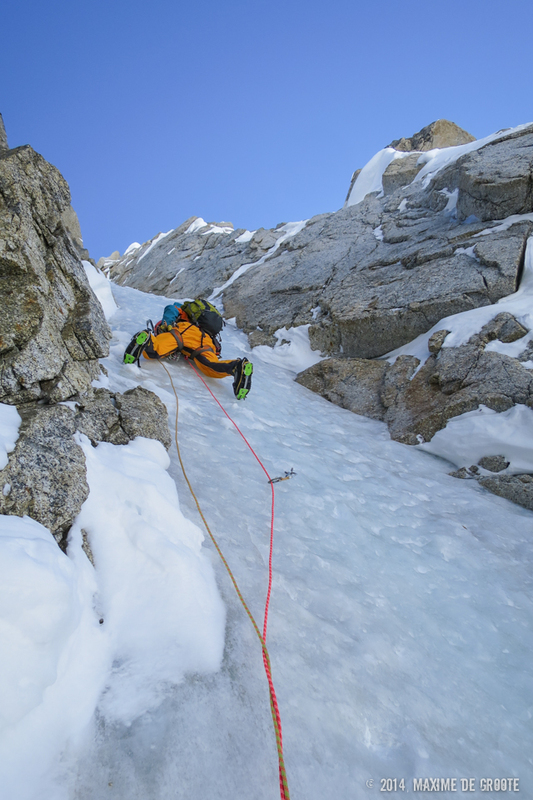 As the couloir turned into a small gully the route steepened, Maxime led another pitch and made belay beneath the crux pitch. According to the supertopo guidebook this crux supposed to be a thin layer of 85° ice but now there was a dry section of 10 meters. I started climbing, first straight up till the part where the ice disappeared. Then following the corner system a few meters on the left. Although there were some cracks with good axe placements, it was difficult to place my crampons. With the help of some aid techniques to rest and scout the next steps I got slowly higher. Almost on the end of the pitch but there is a small overhanging rock formation avoiding us to climb straight up. I made a traverse to the right, back to the original route where I could find some small patches of ice. A bit higher up I made belay and brought Maxime up. Maxime freed the pitch thinking it would be something M6/M7. 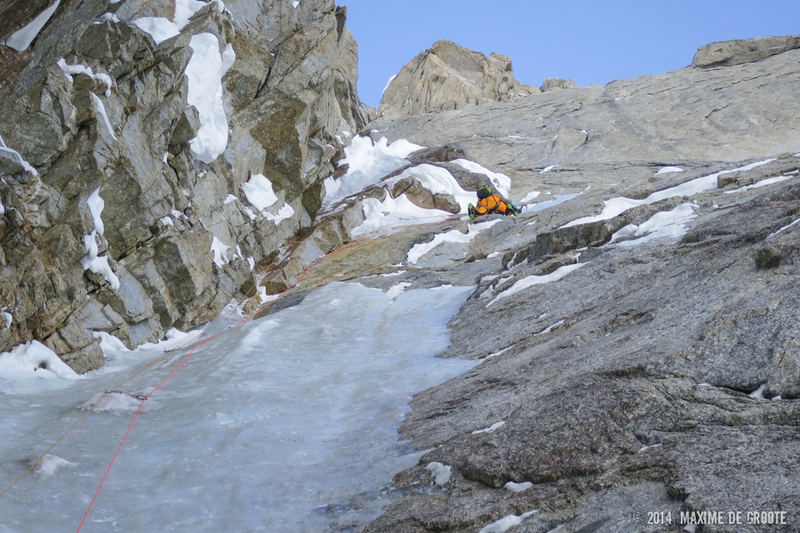 We climbed 2 other steep pitches and the gully kicked back to a 60° snow ramp leading to the summit ridge. It was already late afternoon when we reached ridge. Motivation was pretty low and didn’t fancy the last 100 meters in loose snow to the summit so we started rappelling down. Our confidence grew after this climb. The ice was less hard then we expected and our clothing system seemed to suit the job. 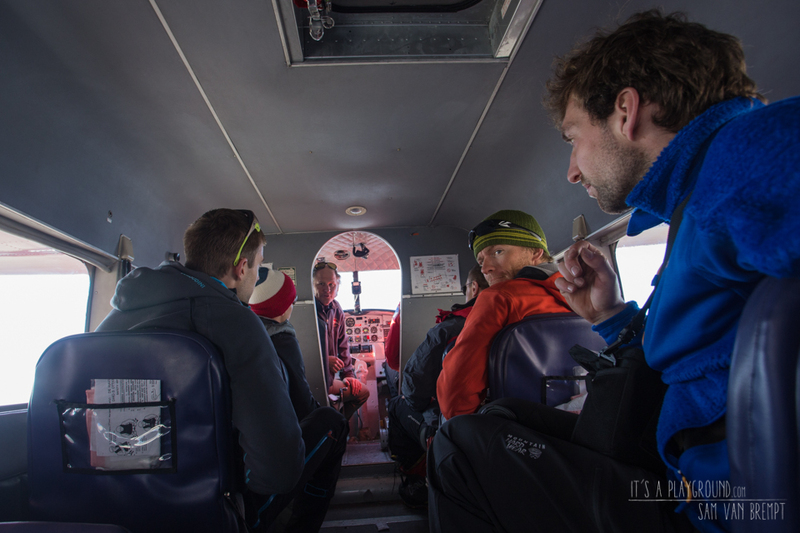 We took a rest day, organising our base camp and slowly some other teams we’re flying in. Some just started their expedition others came over from another Glacier. 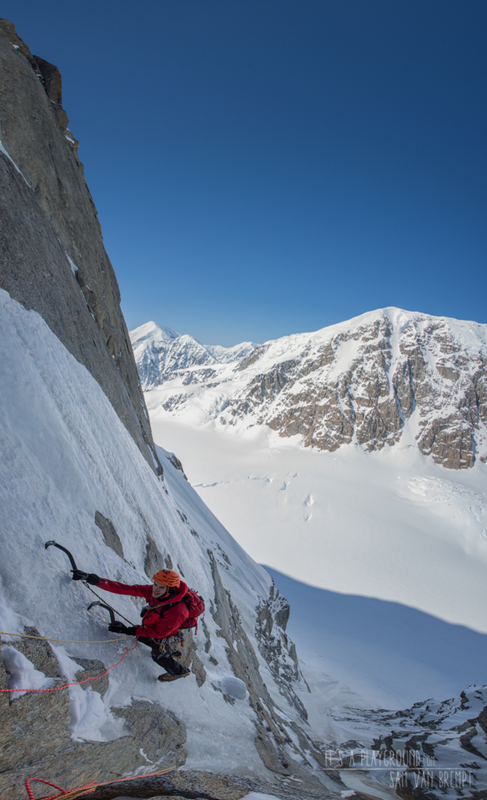 One team, who was dropped of for only 3 days, immeadiatly attempted the Moonflower Buttress but lost too much time on the shrund, and didn’t climbed higher then the Prow. We haven’t been on altitude for a while. 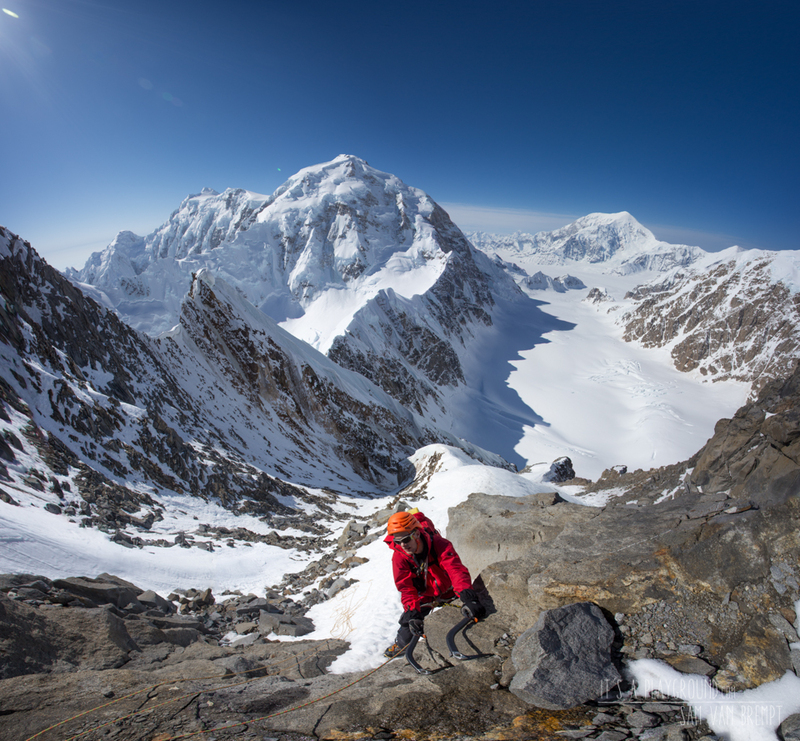 We wanted to make a good shot to go all the way on mount Hunter so we decided to do an extra acclimatisation climb. 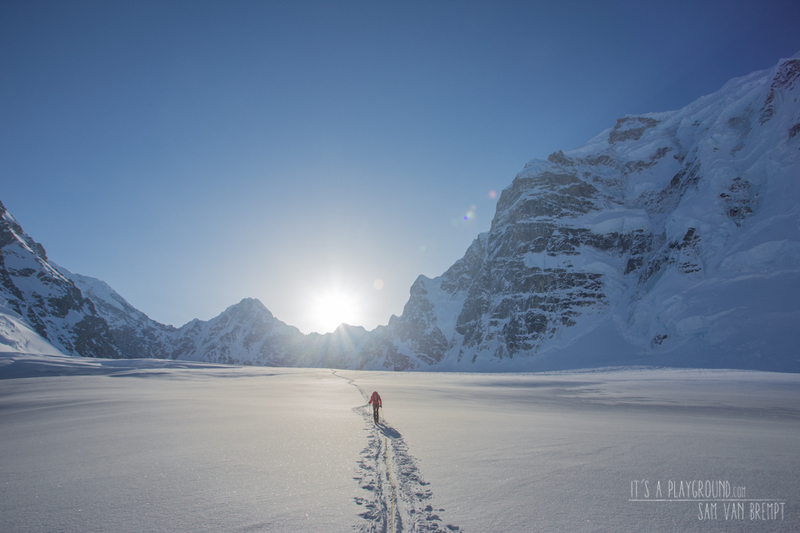 Early morning on the 3th of May we left the airstrip planning to climb Kahiltna Queen by its 1000 meter west face couloir. This route is dangerous for stonefall when sun hits the face. That’s why we thought to leave really early, hoping to top out before noon and staying on the 12.000ft summit till it’s safe again to descend. Kahiltna Queen is the beautifull pyramid at the end of the Southwestfork valley. 3 hours of skinning brought us to the base of the route. 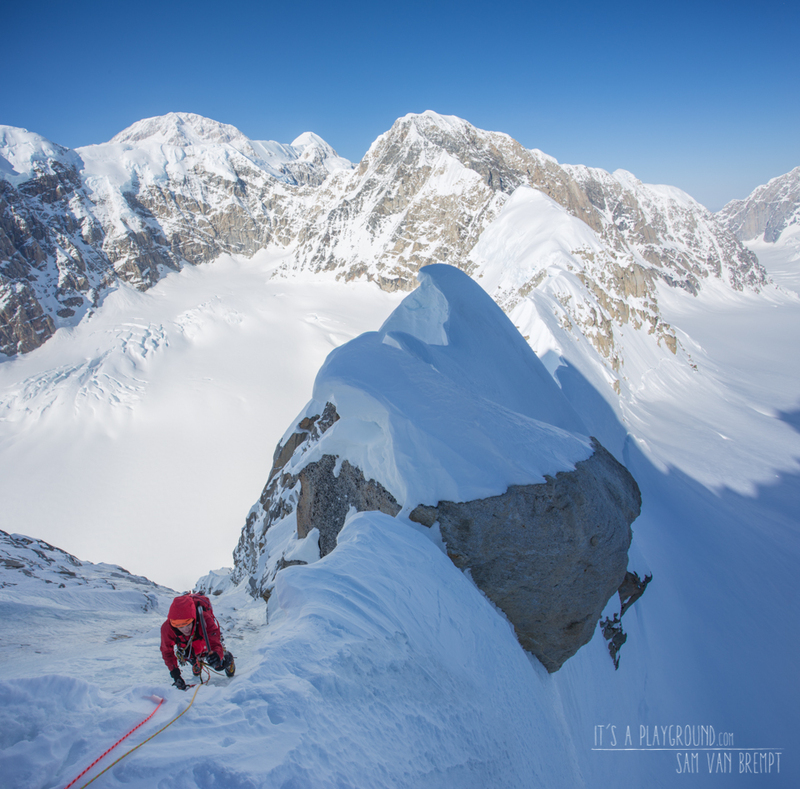 We roped up and simulclimbed the lower angled snowcouloir. Our timing was close but as soon we left the big couloir sun started to hit the upper part and stones started falling down. We were out of the big couloir and climbed to the top ridge. The climbing was never hard and after 5 hours we reached the first summit and traversed to the real summit. 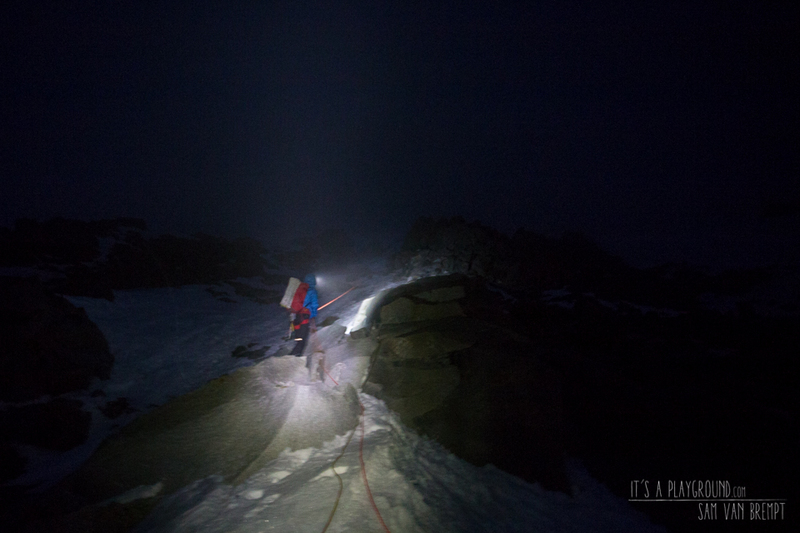 10 meters underneath the summit we returned cause the cornice was too big and scary! 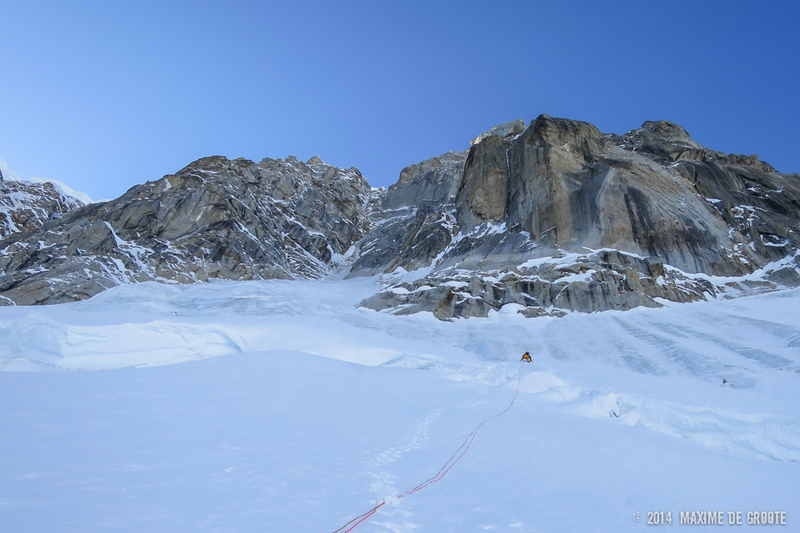 As hoped we found a good bivy on a small platform in between the two summits. A fantastic view around us and for the first time we could see a less steeper version of Mt Hunter’s north Buttress Although the forecast said it will be good weather for another day. Clouds where coming in from behind Foraker. Hoping it will clear, we got into our sleeping bags and waited. Around midnight clouds were coming close and it started snowing slightly. Time to pack our bags and start the descend. Early morning we where back at the Kahiltna Base Camp. Weather forecast showed us some days of bad weather. This was the perfect reason to take a rest and focus us on our big objective, Mt Hunter!